Senior Favorites enjoyed by thousands of residents across the USA, Canada, the UK, New Zealand, and Australia. Incorporate community-specific content such as names and pictures of people, locations, and even social events. Provides communities with state-of-the-art resident-centered individual and group entertainment options. Designed by neuroscientists to support memory and brain health while encouraging social interaction. Designed and tested with over 1000 seniors to be as simple and senior-friendly as possible--with large text and icons. Works on any device—from iPads or Android tablets to Windows/Mac desktop computers. Lease tablets from us or bring your own! to see why seniors love our games and activities! 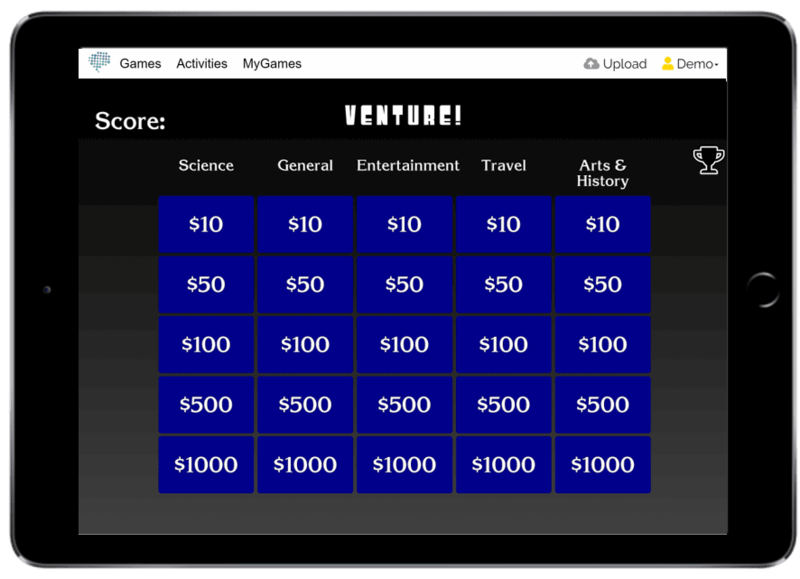 All games are easy to use and can be projected to a TV for a group or played individually on tablets. 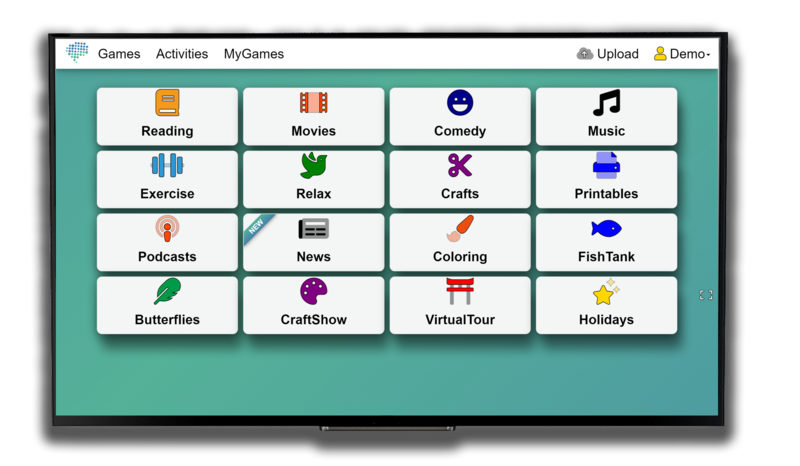 Our activities section packs even more fun with movies, music, coloring, comedy clips, and more! Play fun games custom-made for seniors using personalized content. Have fun learning people's names and personalized trivia! Play senior favorites individually or as a group. Test your trivia knowledge and learn interesting facts! Our 60-second touch tutorials will quickly get seniors comfortable with tablets! No contracts. No cancellation fees. No hassle. Carolyn and Dr. Ali in a Senior Living Community Workshop. Los Angeles, CA. 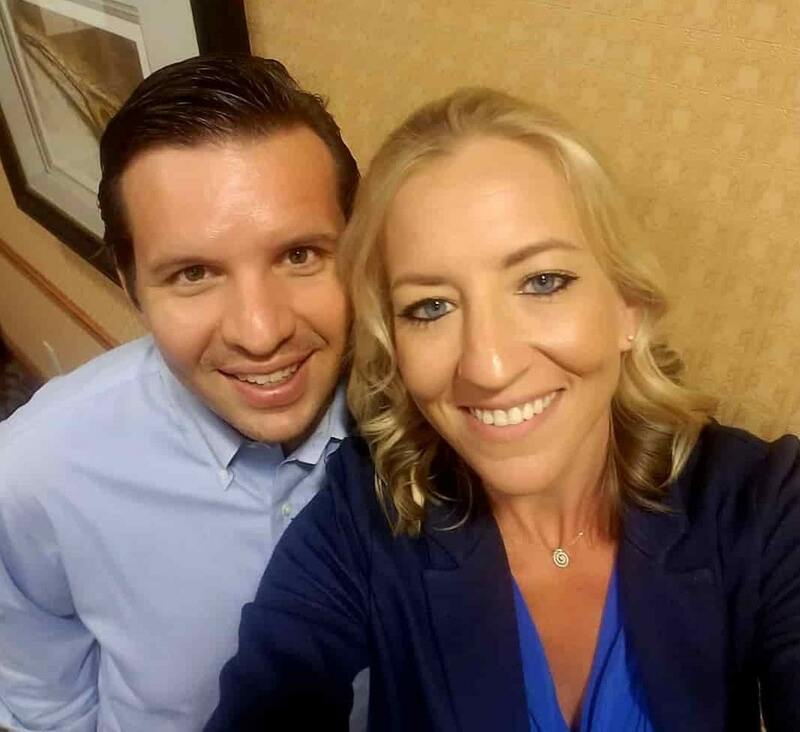 MemoryCo was started in 2015 by husband and wife team Carolyn Dunlavy and Dr. Ali Titiz, also known as 'Dr. Ali'. They both have personal family experiences with Alzheimers and Dementia and developed MemoryCo as a way to help seniors with their memory and cognition. 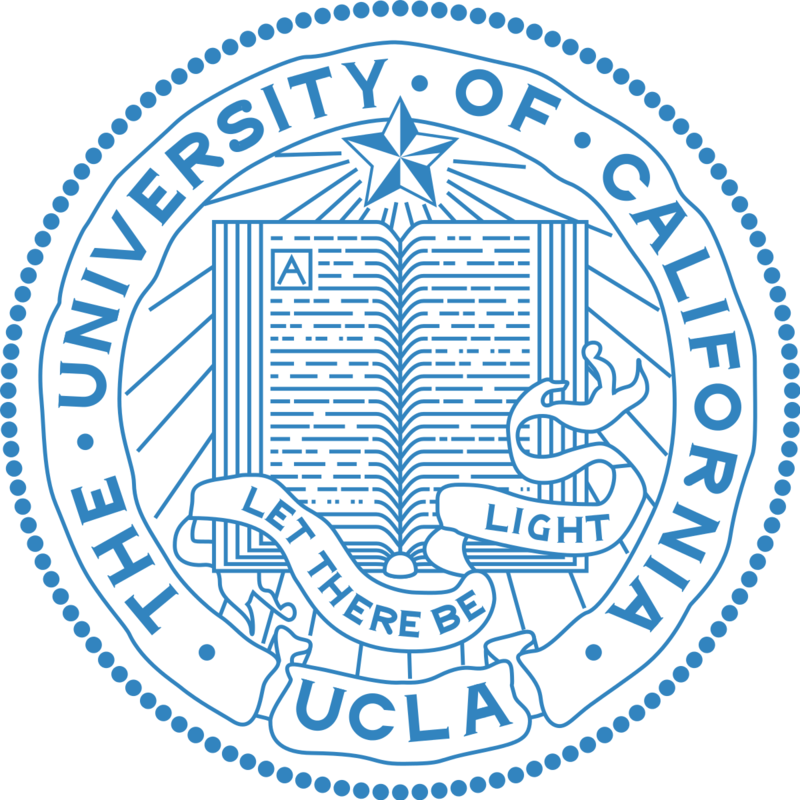 The games provide support for spatial memory, face/name recognition, and recall memory through Dr. Ali's background and training in Neuroscience from both Dartmouth and UCLA (please see below for further information on scientific research and publications). Carolyn's professional background is in finance and business. She has years of experience working with seniors, and is passionate about helping improve their quality of life. 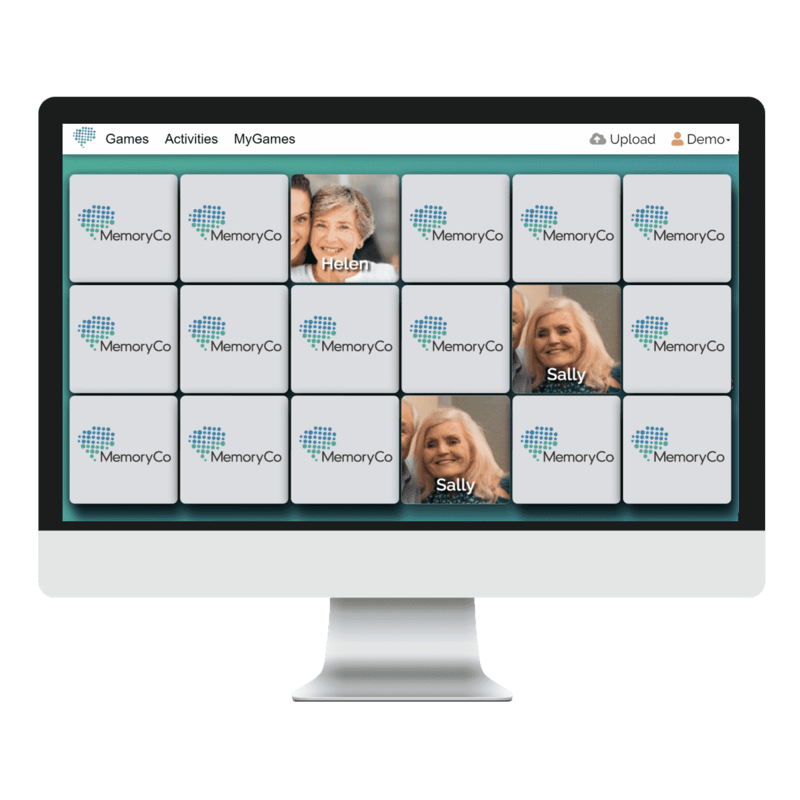 Together, Dr. Ali and Carolyn developed MemoryCo as a new way to approach memory support by incorporating personalized content. Playing a game that uses pictures of people, places, and events that are familiar and relevant, provides stronger support than using generic, non-familiar content (please see references below). Dr. Ali as a panelist in the Field Service Medical Conference. San Diego, CA. 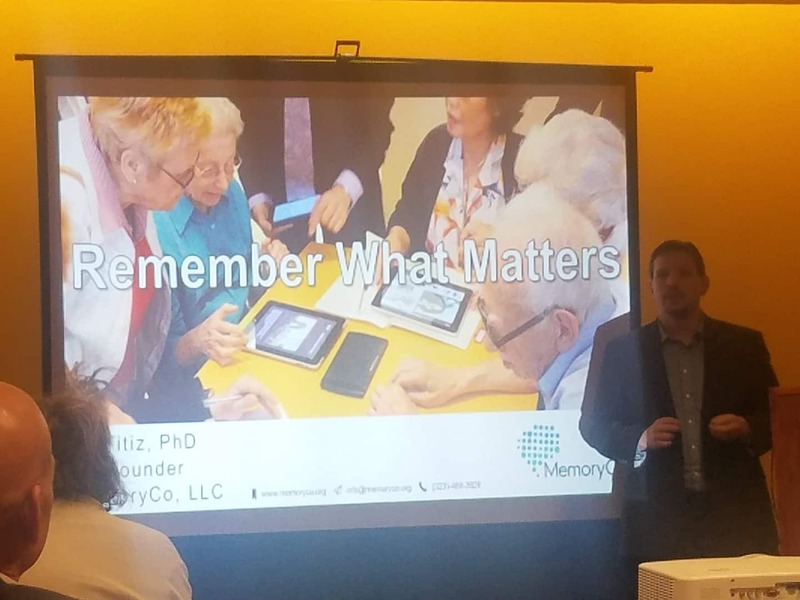 In addition to cognitive support, MemoryCo also provides seniors with a new way to engage, interact, and stay connected through tablets. Once they're familiar with the tablet, it allows even more avenues of entertainment, engagement, connection with loved ones to open up. 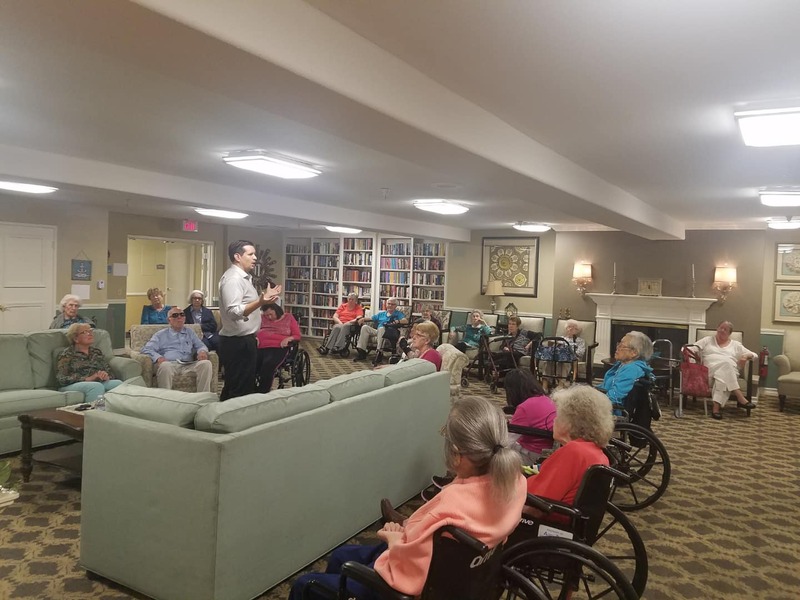 Running a Memory Masters Workshop in a Senior Living Community. Boston, MA. "We wanted to help bridge the gap between seniors and technology. Because of this, we incorporated an optional tablet lease option with our program. What makes our tablets unique is that we curate them specifically for senior use. They are simple, straightforward, and easy to use. 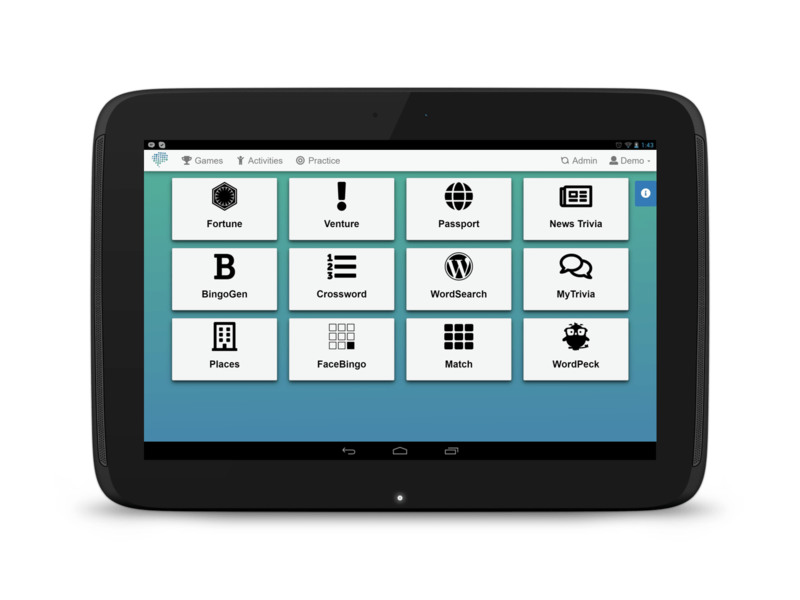 They have larger than average icons, text, and fewer apps and programs, simplyfing the whole experience to take out the potential frustrations of using a tablet. Also included with our tablets are stylus pens (greatly helps shaky or arthritic hands), a cord to hook up to the TV for group games, and a simple tutorial that quickly teaches seniors the correct pressure to use. It's amazing to see seniors that have never used a tablet before take to them so quickly. We did a workshop once and at the end, we had a hard time getting the tablets back from the residents! It was like a new world was at their fingers." MemoryCo is located in Boston and Los Angeles areas. 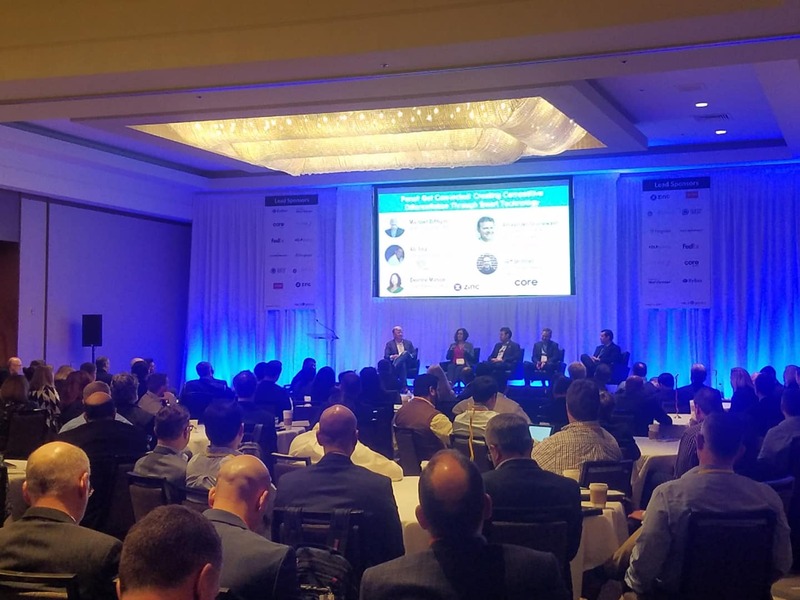 They have recently been showcased as an innovative company at the MedTech Innovator Conference in San Diego, CA, and are actively working with senior living communities and caregivers across the world. Dr. Ali presenting at the World Brain Mapping Conference. Los Angeles, CA. Viskontas, I. V., Quiroga, R. Q., & Fried, I. (2009). Human medial temporal lobe neurons respond preferentially to personally relevant images. Proceedings of the National Academy of Sciences, 106(50), 21329-21334. Titiz, A., Hill, M. R., Mankin, E. A., Aghajan, Z. M., Eliashiv, D., Tchemodanov, N., ... & Behnke, E. (2017). Theta-burst microstimulation in the human entorhinal area improves memory specificity. Elife, 6, e29515. Renoult, L., Davidson, P. S., Palombo, D. J., Moscovitch, M., & Levine, B. (2012). Personal semantics: at the crossroads of semantic and episodic memory. Trends in cognitive sciences, 16(11), 550-558. Okuyama, T., Kitamura, T., Roy, D. S., Itohara, S., & Tonegawa, S. (2016). Ventral CA1 neurons store social memory. Science, 353(6307), 1536-1541. Titiz, A., Mahoney, J. M., Testorf, M. E., Holmes, G. L., & Scott, R. C. (2014). Cognitive impairment in temporal lobe epilepsy: role of online and offline processing of single cell information. Hippocampus, 24(9), 1129-1145. Suthana, N., & Fried, I. (2012). Percepts to recollections: insights from single neuron recordings in the human brain. Trends in cognitive sciences, 16(8), 427-436. Richard, G. R., Titiz, A., Tyler, A., Holmes, G. L., Scott, R. C., & Lenck‐Santini, P. P. (2013). Speed modulation of hippocampal theta frequency correlates with spatial memory performance. Hippocampus, 23(12), 1269-1279. Renoult, L., Tanguay, A., Beaudry, M., Tavakoli, P., Rabipour, S., Campbell, K., ... & Davidson, P. S. (2016). Personal semantics: Is it distinct from episodic and semantic memory? An electrophysiological study of memory for autobiographical facts and repeated events in honor of Shlomo Bentin. Neuropsychologia, 83, 242-256.